"Avebury - One of the most important megalithic monuments in Europe"
Wiltshire - the home of Stonehenge! Some 2000 years after the first farming community on Windmill Hill, the building of Avebury began. It was the descendants of the Windmill Hill people who created the complex at Avebury, their ancestors having created the long barrow at West Kennet. There are many suggestions as to why that particular site was chosen but it seems likely that it was for a number of reasons. The area was already well populated, was a lowland plain bounded by the Marlborough downs, along the top of which ran the Ridgeway. With Windmill Hill to the north west, water to the south in the form of the rising River Kennet and in addition important burial sites in the surrounding area, the most notable of which is West Kennet longbarrow, it is hardly surprising that it was ideal. The initial phase of the construction involved the excavation of the ditches, or henge. Using the most basic of implements, such as antlers, shoulder blades of cattle and mass human effort, this massive ditch and bank was constructed. It has been estimated that originally there were 400 standing stones within the henge and forming the great avenues at Avebury, with the heaviest, the Swindon Stone weighing about 65 tonnes. These stones or sarsens were found on the Marlborough Downs where they lie thickly on the ground. To transport and erect these huge stones required enormous effort. Leather ropes, strapped around huge boulders, would have been used to drag the stones onto wooden rollers. Then the stones were dragged to their destination. It has been estimated that as much as 1.5 million man-hours would have been needed to construct the bank and ditch and to transport the sarsen stones. Once at their site, a small shallow hole was excavated in the chalk, where the stone was to stand. Stakes were set into the chalk, opposite the stone, so that when the stone was raised into position, it would stop the stone falling over. Other stakes would have been driven into the ground to help guide the stone into its correct, upright position. Great care was taken to ensure that the centre of gravity was directly over the hole, a wonderful example being the giant Swindon Stone which has balanced for 4500 years, on one corner, with only a fragment of its bulk underground . Once the stone was raised and held in place by wooden props and ropes, packing material such as chalk blocks and smaller sarsen stones were used to keep it secure. The outer circle, around the inside of the henge, originally comprised approximately 98 stones, while within this circle were two further circles, both of the same diameter.Each was, however, used for very different ritualistic purposes. At the centre of the southern circle was placed an obelisk with a height of 6.4m. In 1723, William Stukeley the antiquarian, recorded this huge stone in its fallen position as being 21ft long and 8ft 9 inches in diameter. Unfortunately it was smashed up for building purposes some years later, along with the 27 stones which circled the obelisk. The northern circle was made up of a ring of 27 stones (of which only 4 survive today) and possibly a smaller circle inside , surrounding the central cove. Originally formed of three stones, it is believed that the cove may have been roughly aligned on the moon's most northerly rising point. 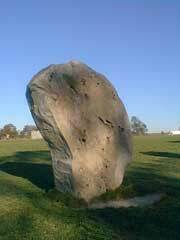 These stones were some of the largest at Avebury weighing over 20 tonnes. The Avebury temple was in active use for about 700 years. Towards the end of this period (c.2000BC) began the mammoth task of collecting the huge sarsen stones which were used for the construction of Stonehenge. Over the last 1,000 years Christianity, ignorance and the need for building materials, have all combined to destroy many of the standing stones in Avebury. Some of the stones were broken up by means of fire and water and some were buried. In 1325, while aiding the destruction, a man was crushed by a falling megalith, coins in his purse buried with him have dated the approximate date of his death. The objects found with him, pointed scissors and a small iron lancet, indicate that he was, probably, a travelling barber surgeon. Avebury is a magical place, Michael and Mary, a pair of ley lines that run from Land's end to Bury St Edmunds, kiss near the stones in the southern part of the circle. The enormous sarsen at the north end of the village, called the Swindon Stone, crosses the road at midnight. The village is the source of intense spiritual energy. This is borne out by the locals, who claim at least one spirit per house! Faeries are, apparently, often seen among the stones at night and it would seem that the Devil, who intended to bury Avebury, accidently dropped his spadeful of earth, which then became Silbury Hill. From London, take the M4 Motorway West bound. At Junction 15 take the exit marked Marlborough. Follow the road until you enter this pretty market town, then take a right turn at the first roundabout. This will take you through the High Street and to another mini-roundabout. Take another right here, and you are on the A4, Bath Road. After some four or five miles you will approach a roundabout, take the third exit, and follow the signs. The Avebury TIC is closed at 2.30pm every first and third Sunday for a Chapel Service.